Lighting is essential to any landscape, as well as any pond. 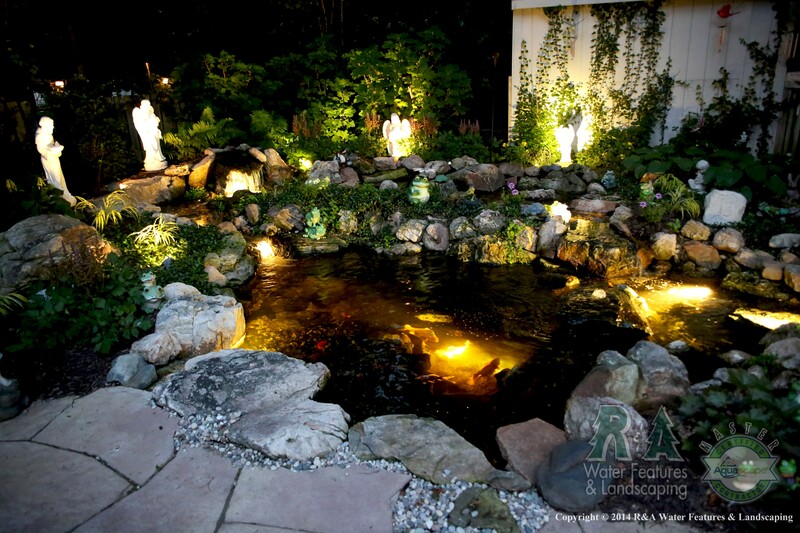 Pond lighting transforms your pond in the evening into a welcoming gathering place, where you can watch the fish swim around and enjoy the movement of the waterfalls. But what do pond lights cost? Here we will go over what you can expect pond lighting to cost. 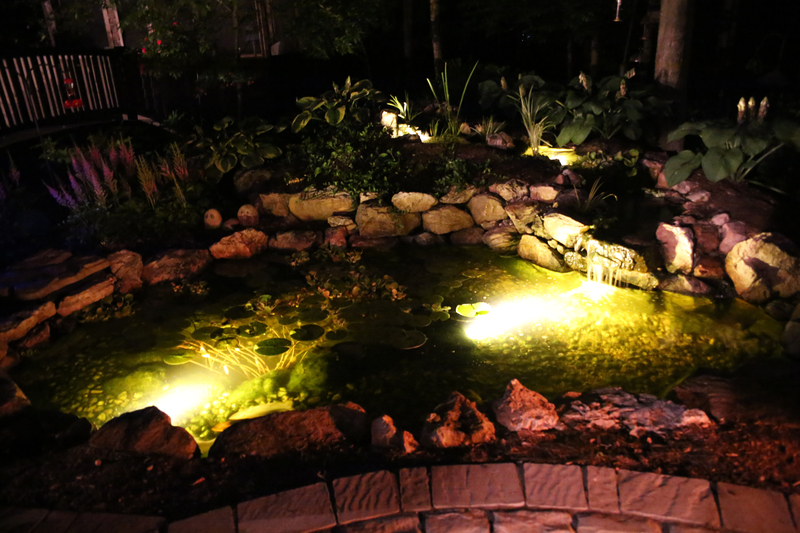 If you have a pond, but currently do not have the lighting…you are really missing out! Pond lighting opens up a whole new world to you when the sun goes down. You get to really watch your fish swim around and see how the water flows. Sure, you might be able to see both of these during the day, but at night everything looks different. If your pond is near a gathering spot, like a patio, why wouldn’t you have lights in your pond?? Check out the difference pond lighting makes at night. The price of one of our 3-Watt LED lights is $330, which includes installation. If a transformer is needed, then there is an additional charge. One great thing about our transformers is that you can get them with a photocell, which will allow you to program a timer which will shut the lights off in 4, 6, or 8 hours, which will end up saving electricity and also prolong the life of the bulb. Typically, most people spend between $1,500-2,000 for pond lighting, when the pond is initially installed. Well..there are two reasons; kids and fish. Many people ask us if we have lights in our ponds. Of course we do! Most of us here have kids, and we all know kids are very curious, so they like to know what the fish do at night. When the kids go out and watch the ponds at night…they absolutely love watching the fish swim around…it can be hard getting them back in the house! And even those of us here that don’t have children, still have pond lights…just to simply enjoy the fish and the water feature as a whole at night. If you’re ready to get lights in your pond or start a brand new project, contact us today! Also check out Ponds 101 for additional answers to your frequently asked questions!